Below are the new features, system enhancements, and bug fixes for v8.1. As always, if you have any questions about a feature, please contact your Implementation Manager or Customer Support. [Enhancement] Term Manager- Copy with adjustment- This is a new option that allows users to preserve last year’s term name and dates when rolling over to a new school year. For more information on the Term Manager, see the help lesson '1.1 (B) and 1.2 (B) Create Sessions and Terms using the Term Manager'. 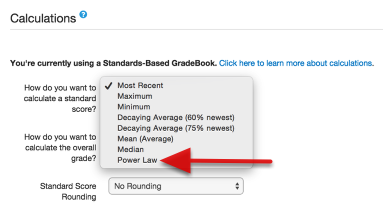 [Enhancement] Added Power Law to Standards-Based Gradebooks, which is a quasi-predictive score calculation. For more information on Gradebook calculations, see the help document 'Standards-Based Gradebook Calculations FAQ'. [Enhancement] Easy peasy! Added shortcut buttons in the Gradebook for Assignment Creation, Managing Students, Navigating between Gradebooks and filtering options. For more information on these new Gradebook features, see the help documents 'Entering Assignment Grades using the Spreadsheet View' or 'Create, Enable or Disable Gradebook Filters'. [Enhancement] BI Tool- New Jasper Prebuilt Report tool within Illuminate allows you to quickly publish new BI Tool reports. [Enhancement] BI Reports now will link to the Favorites widget on a users Dashboard page. [Fixes] CAASPP Performance reports naming update to Smarter Balanced Assessments. [Enhancement] Ahhhh yessssss! 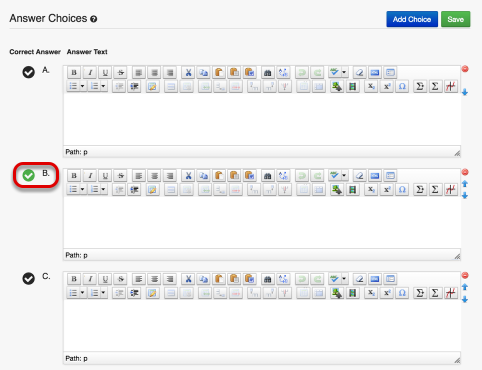 We updated/added Online Testing icons in relation to student responses on the assessment Enter/Edit page. 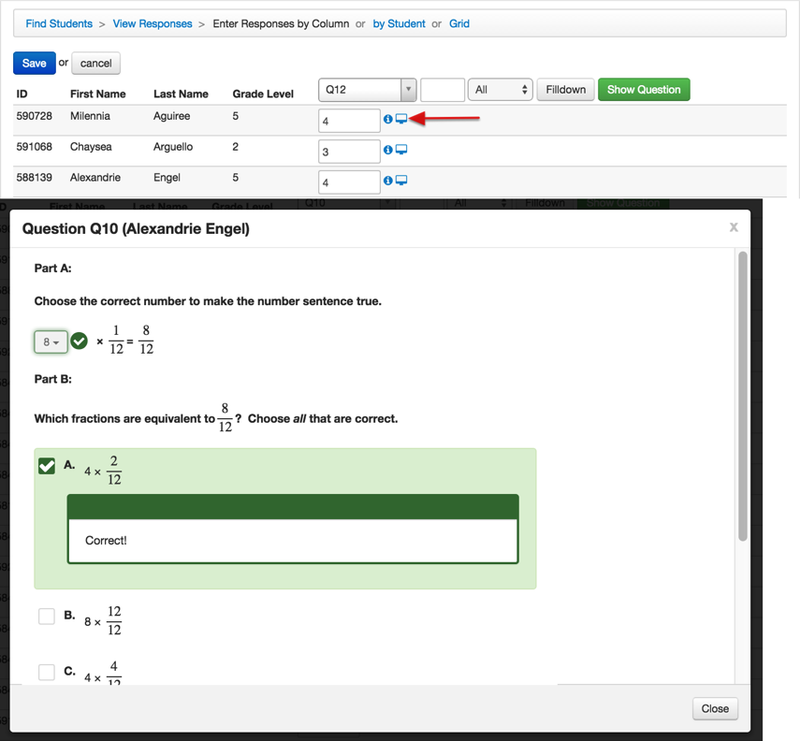 The new Computer Screen icon shows the question in context and shows the correct answer along with what the student chose. For more information on Online Testing, see the help manual 'Online Testing'. 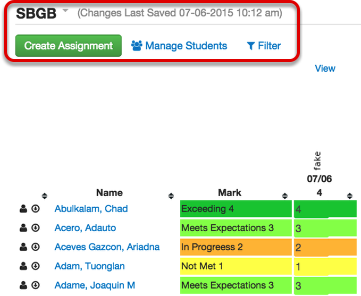 [New Feature] Quick Assessment Creation- Yeah, yeah, we know...FINALLY. Users can now create assessments in the Itembank based on any standard(s) they wish within a minute or two! For more information on Quick Assessment Creation, see the help document 'Create a Quick Assessment'. [New Feature] Item Reference Materials- What do you mean your students don't know every single mathematic formula by heart?! Well, to help them out you can now add an image (material) to an item, i.e. Periodic Table, Formula Sheet, etc. and students will be able to access it within the item to aid them in answering the question. For more information on adding Reference Materials to an item, see the item creation help lessons in the manual 'Item Bank'. [Enhancement] Correct Answer Selection User Interface update. Now its as simple as black and green! [Enhancement] Added a Reset button to the Item search page to clear out previous search filters. Less clicking = winning! [Enhancement] Item ID's will now display for Corespring items. [Enhancement] Improved the speed and performance of the Itembank. [New Feature] Mass Update Sections- Oh, you're tired of updating sections one by one? Who would of thought? Well, this new feature gives users the ability to change section attributes in mass. See in depth information on this feature here. [Enhancement] New Gains and Losses report. The new Gains and Losses report operates in much the same fashion as the prior Gains and Losses report, but with a few improvements and changes. To run the new Gains and Losses report, you can go to the Students tab > Reports > Gains and Losses New. For more information on the new Gains and Losses report, see the help document 'Gains and Losses Report New'. 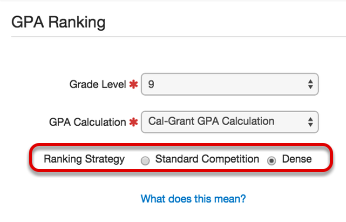 [Enhancement] GPA Ranking- All students are not created equal (when it comes to their GPA anyway), so we added the ability to select different ranking types, Standard Competition and Dense. For more information on GPA ranking, see the help lesson 'GPA Ranking'. [Enhancement] Habla espanol? 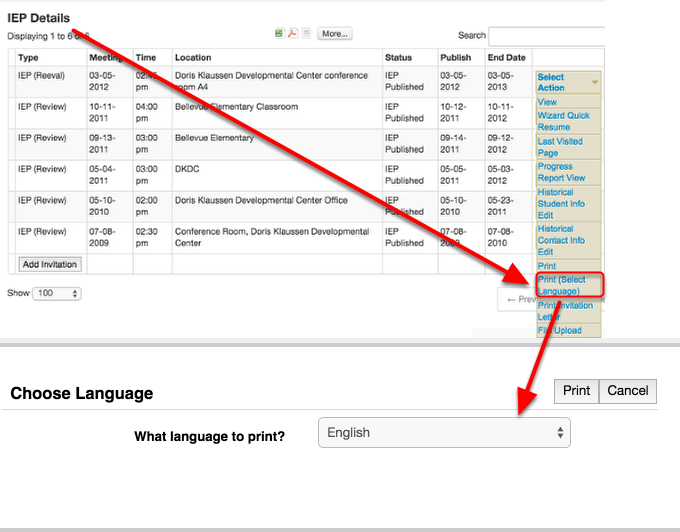 On the IEP or IFSP Details page you can now print IEPs & IFSPs in BOTH English and Spanish.